It's true. Yellow Springs delivers. Well, actually it's not quite that easy, but this is my first installment of a summer CSA program run by one of my fave cheese-making outfits in Chester County, PA. I don't know of any other cheesemakers using the CSA model, but it does seem pretty savvy and -- on the receiving end -- quite deluxe. Every other week an organic grocery service (Panache Foods) drops off a cooler full of goat cheese, along with any meat and produce I've ordered. It's better than getting take-out. This is the second year that Yellow Springs has offered CSA shares, a program that puts 20-24 different cheeses into the hands of their customers over a period from May to November. 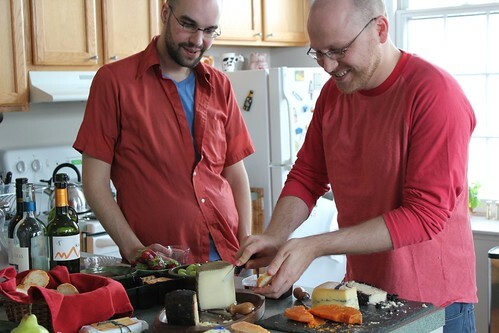 I paid about $250 up front for 13 deliveries; each installment includes 3 varieties of raw and pasteurized goat cheese. My favorite cheese in this batch was Fieldstone (center), an earthy, firm cheese with a delectable rind. The paste was dense like a Gouda, and the flavor called to mind wild grass, prairie weather. On rustic bread, it was delicious with a touch of jam. Bliss, the bloomy cheese on the right, tasted a little soapy -- it wasn't as ripe as the last time I tried it, back in December during a farm visit. The pepper-garlic chevre disappeared from our fridge right away, tucked into lunches, alongside sliced veggies. I'm ready for the next batch of goat-cheese stocking stuffers. It arrives Thursday. I'm excited to try a new cheese from the Renzi's, called Iron Spring -- it's rubbed with paprika and named after the natural spring that bubbles up on their land. The "rusty" rind is a nod to the high concentration of iron that colors the water. One thing that sets the Renzi's apart: they run a native plant nursery in addition to milking Nubians. All of the "flavors" they add to their cheeses are grown on their farm, including saffron, black walnuts, fresh herbs, and honey. 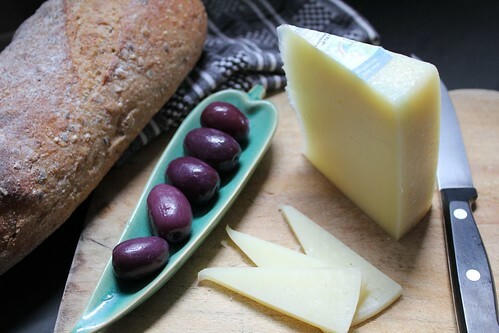 Curious to try Yellow Springs cheese? 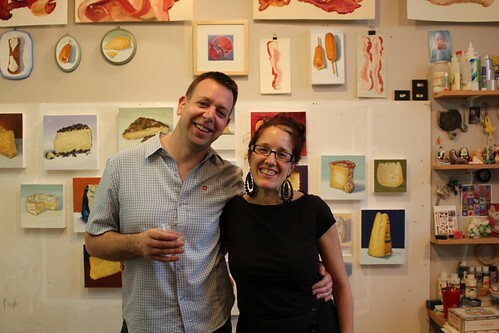 The Renzi's will be part of the Stoudt's Wonderful Good Cheese Festival in Adamstown, PA from 2-5 p.m. on June 11. 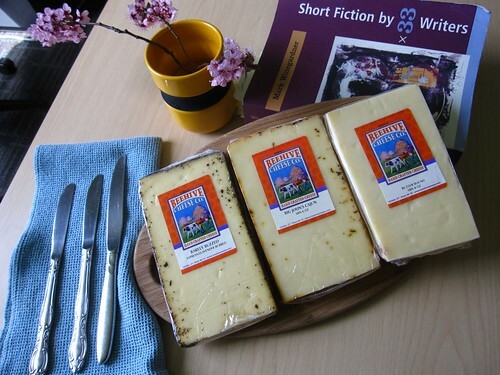 My local cheese column in the June issue of Grid Magazine focuses on this little bunting of mixed-milk cheese. 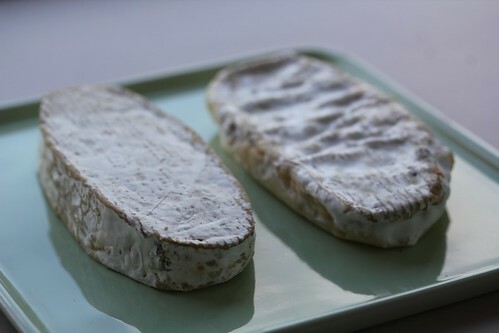 It's a wonderful local robiola called Hummingbird, which has a bloomy rind and creamy interior at about 3 weeks. "You don't see many robiolas in the States," cheesemaker Kristian Holbrook (Doe Run Dairy) told me when I interviewed him for the story. That got me thinking. I've only seen one other artisan robiola that I can recollect, and that was in Iowa. Why don't more cheesemakers produce it? "I like Robiola Bocina," Holbrook told me, referring to a popular Italian import, "but it's too thick for me. Too pasty. I wanted something with more lactic character that would be good at a young age." When I wrote my column for Grid, the only Hummingbird I could find was very young -- two weeks old. It was lemony in taste and springy in texture. My friends and I ate it with homemade raspberry jam and nearly passed out from joy on the living room floor. A few weeks later, I clammed onto a couple older specimen that were exceedingly ripe (beyond 6 weeks, I'd guess). The downy surface mold had turned wheat-colored, and the center pooled onto the counter when I cut into the rind. Oh, momma! That robiola was strong! Hot and sharp. It was interesting to see a cheese change so dramatically after just a few weeks. From lemon sponge to peppery satin. Here is my plea if any cheesemakers are listening: Pssst, make some robiola! It's so dreamy. I fear that once Hummingbird catches on, it'll disappear in a razor-whirr just like the bird. Hummingbird is produced in Chester County, Pa. at Doe Run Farm, home to 16 cows, 30 sheep, and 19 goats. In Philadelphia, it makes appearances at Di Bruno Bros. in the Italian Market and at the Fair Food Farmstand in Reading Terminal. Check out the current issue of Culture Magazine for the spread on cheese-related tattoos. You saw a few of them here first, but there are a slew more, alongside new photos of Ezekial Ferguson and Ian Peacock of Di Bruno Bros. The Philadelphia Cheese Experiment takes place on June 5 at World Cafe Live. It's part of Brooklyn Brewery's national tour of food experiments, where amateurs compete for prizes...like a free trip to the brewery. There's still time to sign up or get tickets to attend. I hope somebody makes a goat cheese brownie to blow my mind. Nine months out of the year, I teach writing and so my reading diet is heavy on literary fiction, essays on narrative, and lots of student papers. I love what I do, but when summer rolls around, I love the wild rush of plunging into whatever book I choose. After graduation last week, I shot off a subscription to The New York Times and began amassing a Jenga-esque pile of books. Here's the dream: coffee on the stoop every morning, with a newspaper on my knees. And when evening comes: a book in bed. Yeah, I'm going old school. No ipad. No Kindle. I want pages, man. Here, in no particular order, are the books on my summer table. Most of them relate to cheese. All of them relate to food. And one is on the list because Mr. Cheesemonger Guru recommended it, and I believe in his karmic good grace. "'Venus!' the hog the hog replied tearfully, as he flew over a brook bubbling between stones, his little hoofs brushing the hazel bushes" (244). Dianne Jacob is a cookbook author, food writer, and blogger. Her advice on developing stories and pitches is spot on, and I especially like her new chapter on blogs (she stresses narrative, good research, proofreading). It's a book I skimmed back in October, but now I plan on delving in for reals. For anyone interested in reviewing: Jacob's explanation of ethics is thought-provoking. Having run the food section of a newspaper, I have to say that I bristle sometimes at how online reviewers approach food. There's a fine line between enthusiasm and ad copy. This past year, I got interested in the plight of Sally Jackson, who was shut down by the FDA on charges that later appeared to be false. I am all for food safety, but I also want cheese makers to retain the right to produce raw-milk cheese so that people like me can enjoy them. Journalist Joel Salatin explores this struggle and the legal red tape that has affected cheesemakers over the last decade. Interestingly, Salatin comes from a family of dairy farmers, but he left the business to become a reporter (later becoming an editor for The Wall Street Journal). You'll recognize his name and his current project, Polyface Inc., if you've read Michael Pollan's The Omnivore's Dilemma. Salatin's book opens like this: "I drink raw milk, sold illegally on the underground black market." I've never been to Ari Weinzweig's Ann Arbor delicatessen, which is so famous for its cakes and pastrami sandwiches. But I have friends who buzz like Tsetse flies when anyone mentions the "Z" word. I was curious what Ari's spiritual food manifesto might include so I ordered the monster, and when it came in the mail I found myself sucked in by, of all things, rice! "Buying 'Italian rice,' however is akin to picking up a block of cheese simply labeled 'Cheddar' -- there's a huge variation in quality form one source to the next" (161. Of course, I read this right after buying a mega ton of arborio, and now I'm living rice regret. I feel like a big fat schmuck for not having read this sooner, but the cuteness of the title put me off. Still, every time I open my inbox, some darling stranger asks me if I know how to become a cheesemonger...or if I know of jobs in the cheese world. So, reading this seems to be an imperative. For my advisory role. Or just so I can say something intelligent. "In a volatile and gentrifying city like San Francisco, a lot of a neighborhood's character, for better or worse, isn't held together by neighbors, but by the neighborhood corner stores and local business" (190). Margaret Hathaway and her beau yearn for life on the farm, so they pack up their New York City apartment and take to the road to get their fix. First stop: Artisanal, to meet Max McCalman and ask him about who makes goat cheese in the U.S. They taste some extraordinary samples, then set off to meet other goat lovers. "A cloying floral scent emanates from the chain-link fence that marks the fair's perimeter where a young woman shampoos her goats, scrubbing them until they're covered with a thick lather, then hosing them down and blowing them dry" (34). This book has gotten so much press, it seems almost silly to mention it and become one more googly-eyed, whisk-waving fan. But it's fantastic -- the best food memoir I've read to date. I listened to the audio version (audible.com), where the author handles the narration, and just hearing that ragged edge in Gabrielle Hamilton's voice brought the story to life. "With his right hand, he [Andre Soltner] tapped his left wrist, like a junky searching for a good vein, over and over, causing a little vibration in the pan that pushed the omelette incrementally with every tap up against the lip and then, when cresting, back in over itself until the whole omelette was folded over into thirds, a perfect football shape, absolutely no color on it, just perfectly cooked yellow omelette, and he put the little torpedo onto the plate for lunch" (158). 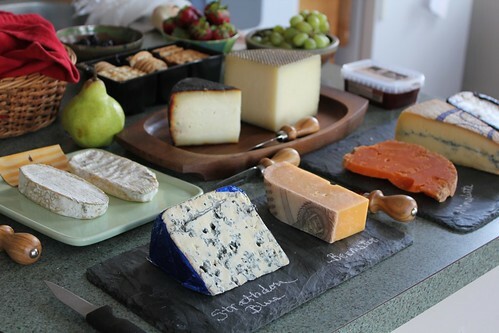 "A refrigerator for chilling wine (a wine cooler) makes an excellent aging environment for this cheese. If you do not have that option, then you can age it in your home refrigerator" (116). Curious. 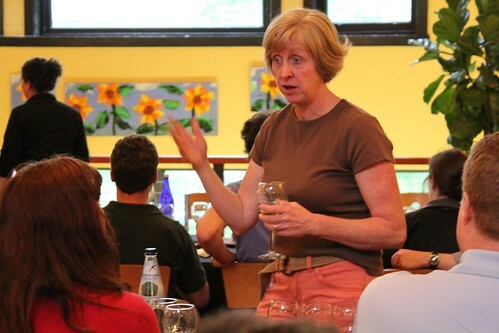 There's an interesting array of information here, from cheese recipes, to profiles of artisan cheesemakers, to pairing ideas, to aging tips, and resources. For anyone interested in making cheese from scratch -- including blues, Brie, and Manchego -- this appears to be a good launch pad. Boyfriend gave me this book as a present in December. Haven't had a chance to nibble its pages, but I like what I see: Vegetarian Scotch Eggs, Wicked Good Clam Chowdah, and Blueberry Bread Pudding with Soft Curd Cheese. This is a good introduction to a wide cast of food bloggers. Each recipe is accompanied by a post, along with a short bio. Smack your lips, chiquitas! And let me know what books are on your summer reading list. Back in April, a friend gave me a bag of lemons from her family tree in Florida, and their bright floral bite sent me on a citrus binge. That’s how I came to Pantaleo, a firm Sardinian goat cheese that smells like lemon yogurt and tastes – in its youth – as delicate as the Madaleines that sent Proust into literary reverie. Pantaleo even dissolves into crumbly bits on the tongue, like a cookie. Italian cheeses, I have learned, are transformative. To keep reading, please click here to jump to the Di Bruno Bros. blog. Full disclosure: I freelance for Di Bruno Bros. twice a month. They pay me to write about any cheese I like, and I run a nugget of the post here. For the spring grilling season, Madame Fromage fires up the barbie and prepares a simple goat cheese appetizer using home-grown tomatoes and rustic bread. Filmed in Madame F's backyard, this episode conveys the best of Philadelphia patio culture, from brick walls to the mind-numbing trill of the ice cream truck. Enjoy! And should you want to recreate this recipe, simply use a fresh goat cheese marinated in olive oil. Cheese TV with Madame Fromage is released once per season. To view our last episode, click here. Many thanks to Aimee Knight and 7 Sleeps Productions for producing this show. Sue Miller, a.k.a. Lady Birchrun, makes some of the tastiest washed-rind cheese in the hills of nearby Chester County. She uses raw milk and salt brine to produce two fine specimen, Fat Cat and Red Cat. 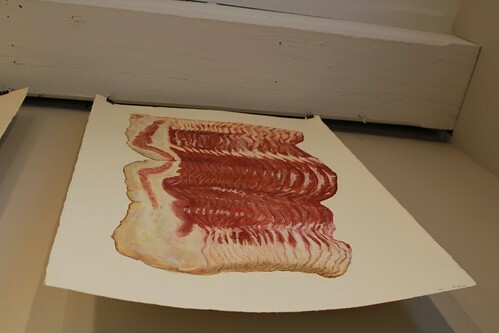 The first is bacony, the latter mushroomy. If you taste them, you will purr. Jean Broillet IV is not the king of a small country, but he could be. He is a twenty-something saison superstar who started brewing beer as a high-schooler in his parents' garage (you know how those rural science projects get started). 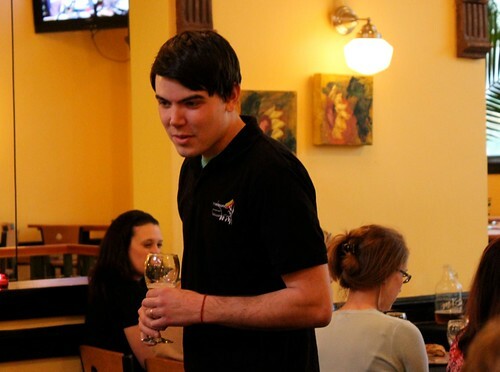 Brewer Broillet put himself through college by working at Weyerbacher and Iron Hill. Now, he plans to open his own brew cafe, Tired Hands, in the 'burb of Ardmore. Beer geeks, revv your engines. Together, Miller and Broillet have made fermentation magic by washing Red Cat cheese with Tired Hands beer to create a lucky little star they call "Proto-Cat" -- soon to be christened "Tired Cat." Cat lovers, you may start yourrr motors. 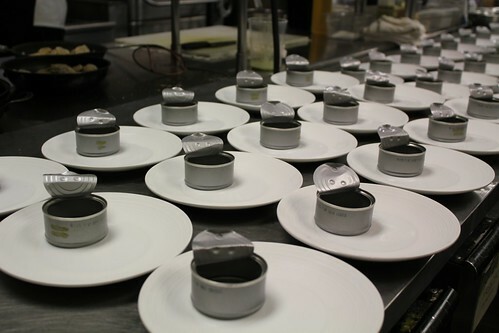 Here's what happened when Chef Rob Sidor of Di Bruno's catering department decided to create a special pairing using local ingredients involved in this fermentation project. 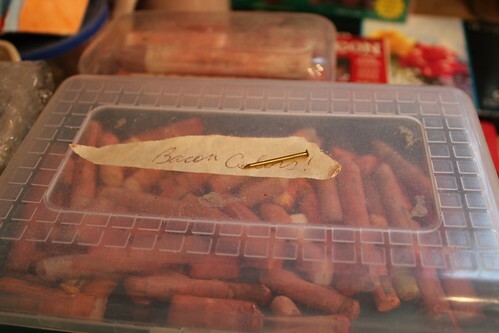 Hint: it involves crumbs of calf tongue. 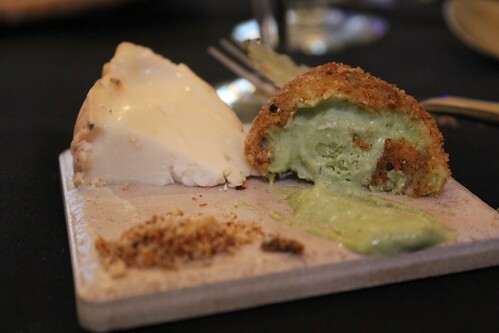 You're looking at a wedge of Tired Cat with fried tomatillo ice cream, rolled in calf tongue crumbs and malt. 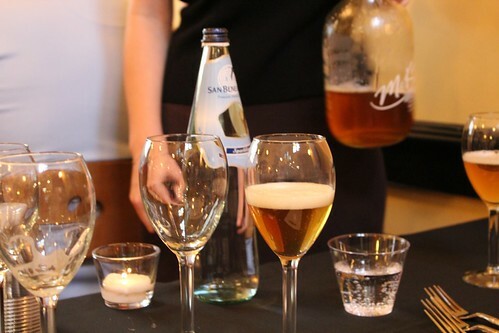 Jean Broillet served this course with a glass of Vulpine, a "super saison" with hints of cedar, lemon, coconut, vanilla, and honey. I nearly wept. This might be the best saison and the best/weirdest/wildest cheese pairing I have ever eaten. See aren't you glad I told you to get a napkin? I love when cheese sparks creativity. I'm not talking about the invention of the Cheez-It. I'm talking about collaborations and pairings that make people experience flavors and textures that have never existed before. Here's another one. Ready? You're looking at fava bean gazpacho, served with a raw clam and crumbled Birchrun Blue Cheese. 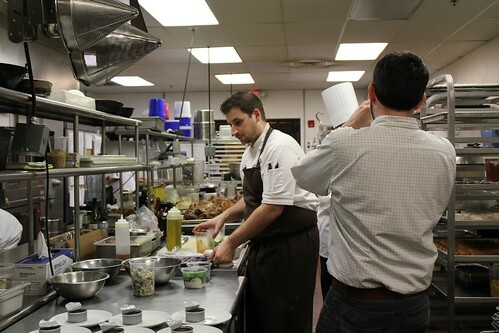 "I like to subvert people's expecations," Chef Rob told me. "Most people expect blue cheese as a final course. That's why I served it first." Chef Rob served the gazpacho in wee tuna cans -- they looked a little bit like, uhm, cat food cans, but then...this was a Fat Cat dinner, right? For dessert: home-spun marshmallows made with D-2 syrup (it's used in brewing), alongside graham cakes, apple, and Equinox. The latter is Sue Miller's most approachable cheese, a baby Gruyere with a nutty halo. Oh, Philadelphia, oh people of Pennsylavania, we are lucky to have so much culinary talent in our midst. Look for Birchun cheeses at local farmers' markets. Prepare yourself for a new microbrew king. Ready yourself the next time cheesemonger Rich Morillo brainstorms a pairing dinner. This kind of culinary skill and appreciation for the land -- its plants and animals -- are rare. Chef Rob Sidor deserves a standing ovation. Thanks to everyone for a wonderful evening. May there be many more pairings to come. Full disclosure: I have a freelance relationship with Di Bruno Bros. and was invited to attend this meal as a blogger-in-residence. If you recognize this cheese, you probably know Sue Miller, one of Pennyslvania’s farmstead cheese pioneers. 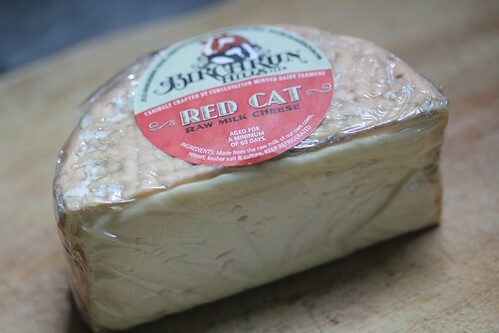 Sue has been making cheese at her home in Chester Springs for a long time, and she is rocking the washed-rind world with her spunky Red Cat and Fat Cat -- variations on the same cheese, but they're washed differently. Her Birchrun Blue is already a classic. 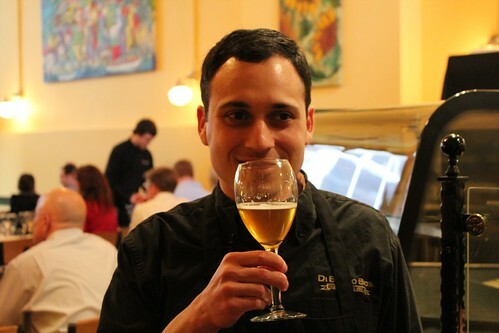 On Thursday, May 12, 2011 Di Bruno Bros. is hosting a special 5-course dinner that will incorporate Birchrun cheeses along with craft beer from up-and-comer Tired Hands Brewing. In fact, Birchrun and Tired Hands have collaborated on a new cheese, and I suspect a wheel of it just might make it to the table on Thursday night. Fingers crossed. I’ll be there, along with cheesemonger emcee Rich Morillo and Di Bruno’s new king of the kitchen, Chef Rob Sidor. 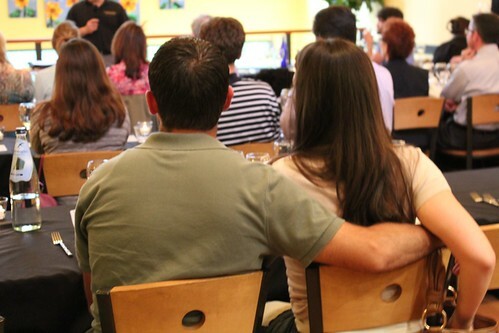 A few seats for Thursday's dinner are still left. Tickets are $45 now and $50 at the door. 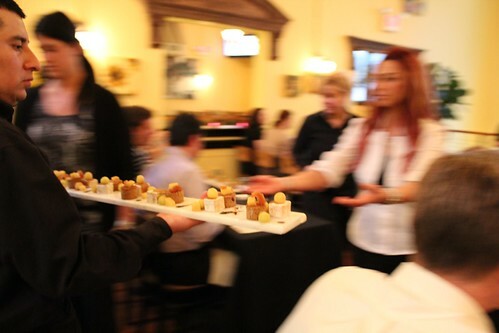 To reserve, just email catering@dibruno.com. The celebration starts at 6 p.m. on May 12 in the Upstairs Café at Di Bruno Bros., 1730 Chestnut Street. Note: I suspect that “Proto-cat” is the ghoulish micro kitten that Birchrun and Tired Hands created during a surly brawl of creative mind-melding. Sue Miller tells me this dream wheel is washed in Flemish Black. You can expect a full report later this week. On Saturday, we set out the cheese. Each one had been painted. 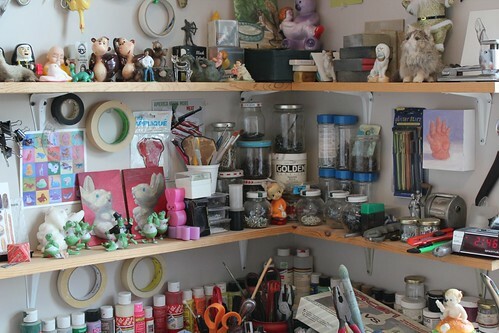 Mike Geno, the artist, had his own cheese board displayed in a studio off the back of his loft apartment. The photo is a little dark, but you get the idea. Mike has spent the last several months in a Zen cheese zone. On Fridays, he and I would walk to cheese shops across Philadelphia, in search of the most aesthetically pleasing wedges. 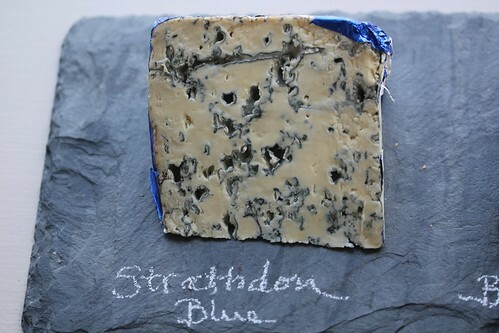 He liked crags and texture, like this wedge of Strathdon Blue. It's one of my favorites -- a Scottish beauty, full of beachy flavor. The cheesemaker, Ruaraidh (pronounced "Rory") Stone, makes this cheese in an old brewery right along the Scottish coast, and he claims you can taste the sea in his cheese. I think it's true. Mike captured the beauty of cheese in his portrait series. 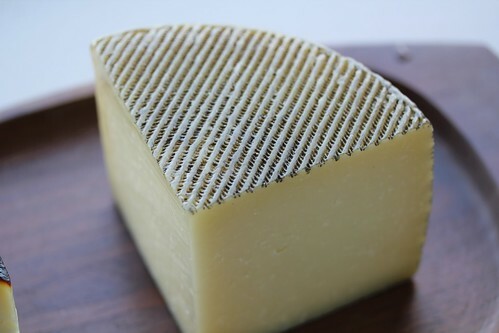 When I look at wedge of Manchego now, I can't help but study the rind. 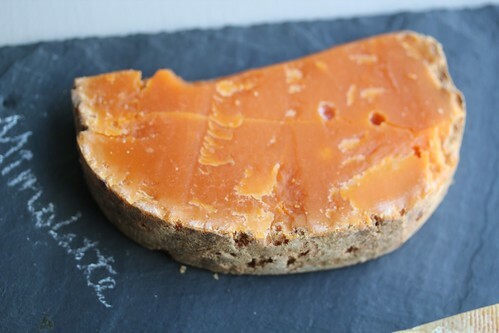 Even Mimolette, with its moonscape exterior and annatto-tinged interior -- so waxy and weird -- has become more intriguing. 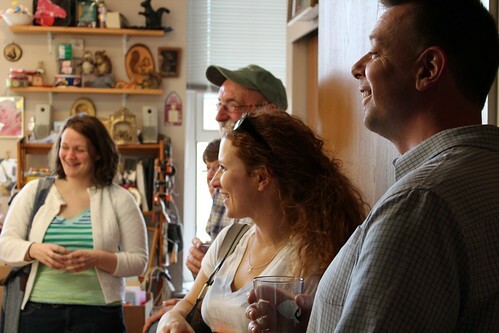 We had a lot of fun showing people how to see (and taste) cheese in new ways at our secret studio tour. Lots of you showed up in your Saturday best, matching red shirts and all. 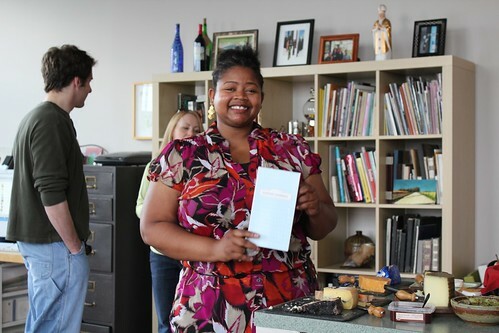 Kisha, you even brought your cheese journal. Splendid. 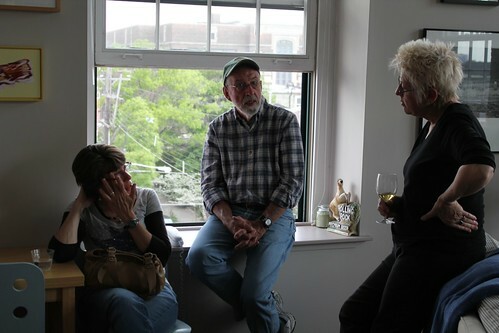 Debbie and Fred from Amazing Acres showed up to view "Sea Smoke," a cheese they used to make. Ahhh, Sea Smoke. 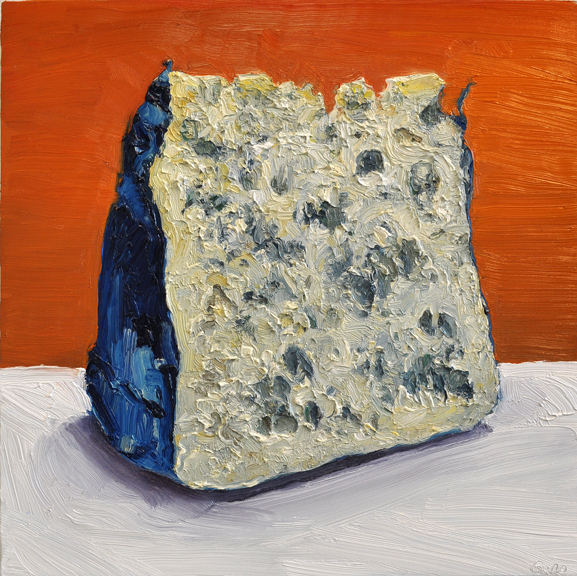 It was fun to watch people's reactions as they nibbled cheese, then went to view it in the studio. Along with all of Mike's tchotchkes. Here we are, at the end of a happy day. 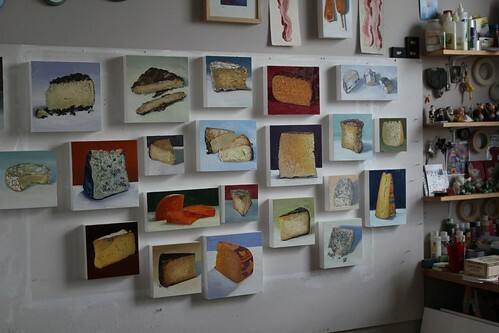 Mike's cheese portraits will soon be on display at Cakespy in Seattle. If you want a preview, visit his flickr gallery. You can always find Mike at mikegeno.com. 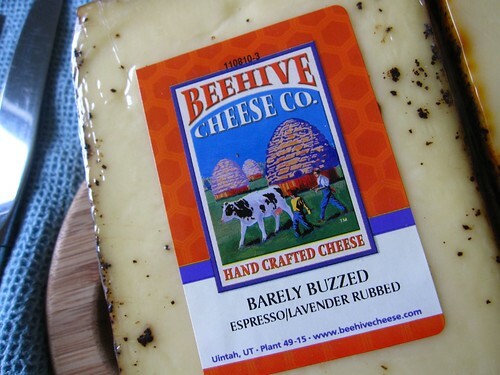 I have always been intrigued by Beehive Cheese, a company out of Utah that produces a cheese called “Barely Buzzed.” It’s rubbed with espresso grounds and lavender. Occasionally, a wheel appears in cheese cases, but somehow I’m never quick enough to score a wedge. To my great delight, Beehive sent me a box of samples recently. So, I took them to work. 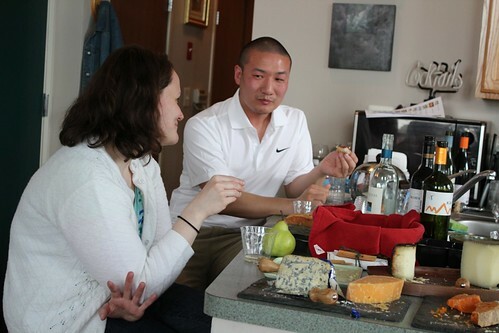 Who better to share coffee-laced cheese with than a group of college students? My Fiction Workshop this term is a splendid little posse, so one day, instead of giving them a quiz over Flannery O’Connor, I tested their palates. In a blind tasting, could they name the flavors of this curious cheese? Had they truly become skilled observers? 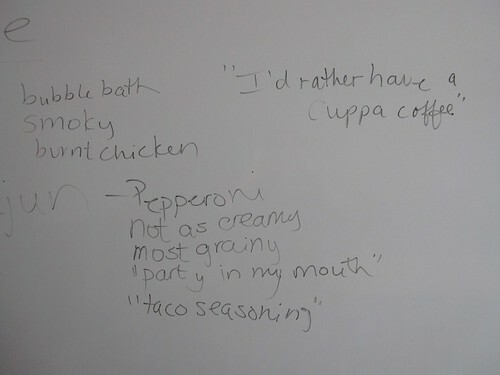 I jotted down the students' comments on a white board. They smelled each cheese, then tasted, and their faces shifted from surprise to awe to explosive delight (with a few frowns in between). Barely Buzzed tasted like smoky bubble bath to some, while others found the experience profoundly exciting. “I’ve never tasted anything like it,” one said. 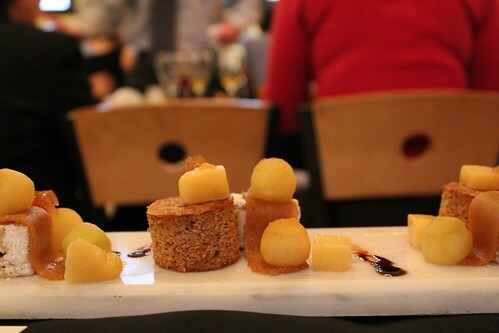 “I definitely want to try this again.” I agree – it’s a curious blend of flavors layered onto a mellow, buttery cheese. No wonder it won 1st place three times at the American Cheese Society in the category of Flavored Cheddar. Big John’s Cajun was a “party” in the mouth. I found the spices a little overpowering and the texture a little grainy, but my student S., who always wears a Guinness shirt to class, loved discovering a cheese that tasted like pepperoni. Butter Bound was the least complex but also the richest in taste. The whole class loved the ultra-creamy texture of this cheese, which is bound in cloth and rubbed with organic cultured butter. Was there a winner? No. The class was split three ways, with factions advocating for each selection. As a group, we loved the imagination behind this company. 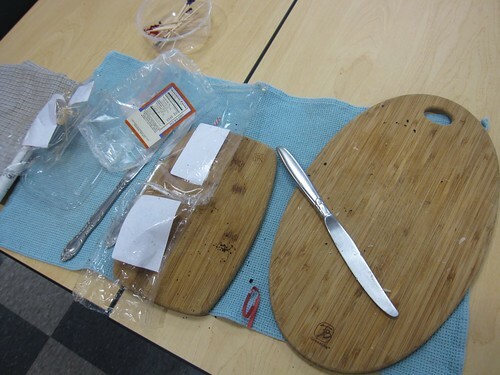 When I told my students that Beehive Cheese is owned by a pair of computer guys who dropped their day jobs to become cheesemakers, one student got very excited. He confessed that he hoped to become an Australian sheep herder, and he wondered if he might make some sheep cheese! I tried not to look too excited. My students filed out of the classroom, taking every last morsel with them. And so, the semester came to an end -- with cheese and espresso and lavender. And many good stories to remember. Paški Sir is the first imported cheese from Croatia – it’s actually produced off the coast, on a craggy island called Pag. To continue reading, please visit the Di Bruno Blog.